A Laboratory Technician is progressing his way through a manufacturing firm as he completes an apprenticeship which aims to tackle a growing skills shortage. Declan Keane has secured an apprenticeship opportunity at Milliken Industrials Ltd, an automotive company which produces airbag fabric. During this programme, Declan is gaining the skills, knowledge and experience of working at a textile company and gaining an understanding of an industry which presents a growing skills shortage. The talented former St Gabriel’s RC High School pupil has made such an impression on the company that he recently received an Outstanding Performer accolade at the annual Milliken Awards ceremony. The 17 year old was recognised for consistently going above and beyond in his role. 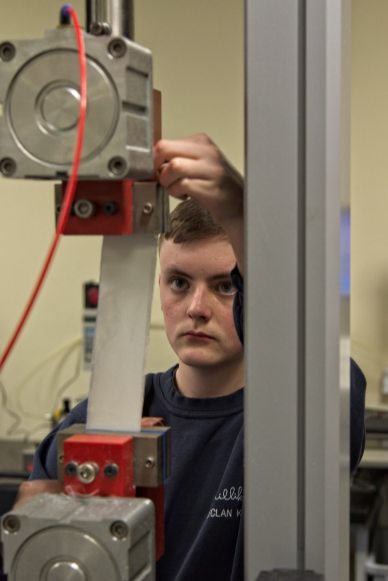 Declan started his apprenticeship in March 2018 and is due to complete in July 2020. During his training, Declan will cover areas such as the process of making airbag fabric, inputting data and general administrative tasks.